In conjunction with his solo exhibition "Before It All Goes"
Darren Soh is an architecture photographer whose solo exhibition Before It All Goes: Architecture from Singapore’s Early Independence Years is on at Objectifs’ Chapel Gallery till 29 Sept 2018. He has also published a book of the same title. Read on for a recap of Darren’s artist talks and recent seminar held in conjunction with the show. Darren Soh started working as a photographer about 20 years ago. For about seven years starting out, he “shot anything and everything, in order to make a living” but decided that he wanted to pursue exclusively architecture photography by any means necessary. Thus, he shoots commercial projects for architects and for developers. Most of the images in Before It All Goes were shot in his own time but can occasionally yield some income through print or book sales. Learn more about Darren Soh and his career in this short documentary by Objectifs. The Feb 2018 news of Pearl Bank Apartments’ collective sale and impending redevelopment provided Darren, together with Objectifs, a strong impetus to present Before It All Goes. Using this building as an example, Darren shared how he approaches shooting an architectural site. 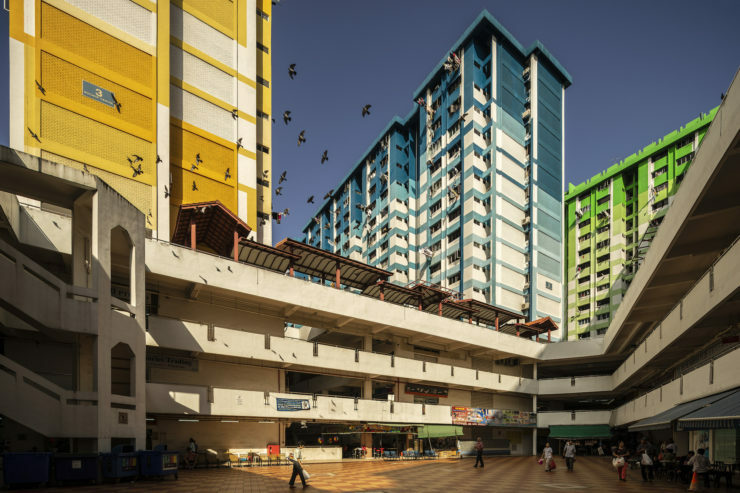 Darren started photographing Pearl Bank Apartments in the early 2010s but the majority of his images were made in the last two to three years. The building’s curved nature makes it very interesting to him from a photographic point of view. A “standard view of the whole building” is an essential part of architecture photography. For this, the photographer needs to know of suitable access points, which may require research and a site recce. 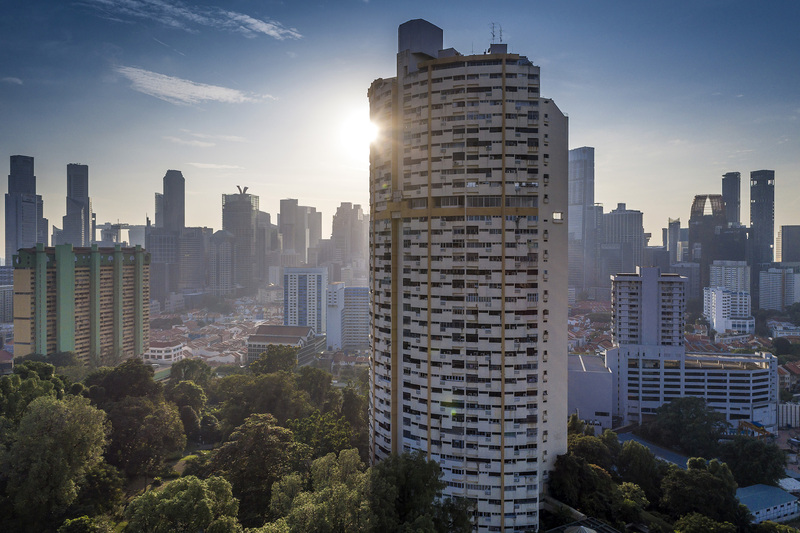 Darren has shot Pearl Bank Apartments from Kreta Ayer Centre and Pearl Centre. He has also shot buildings from angles which are no longer possible to achieve, if another development sprung up blocking that point of view. Give a sense of scale by shooting a building with something else in the frame for comparison, as Darren has done in his image of Pearl Bank Apartments with a bench in the frame. “Everyone knows the size of a bench, so it can give a sense of how massive Pearl Bank Apartments is”. Human figures are also helpful in conveying a sense of scale. Close-ups can also highlight distinctive architectural features such as Pearl Bank Apartments’ curved nature. He may use a telephoto lens for such shots. “Situate the building in context”. “Go much further back and shoot in context.” Darren enjoys doing so as it allows for “exploration work”. He shot Pearl Bank Apartments from HDB blocks in Tiong Bahru, some of which are 35 storeys high. He used ultra-wide angle lenses to capture the building in its broader environment. A tripod is helpful for such shots, and he uses not a ball head but a geared head tripod for architectural photography. Darren Soh’s shot of Pearl Bank Apartments in a wider context conveys a sense of its sheer scale and unique shape. “Go down and point upwards, or go up and look down for a dramatic effect”. Besides such shots, Darren tries not to tilt his camera, and keeps everything straight, as “the building is built that way — everything is straight”. He uses a tilt-shift lens to help him achieve straight lines. Shoot at different times of day (and night). A building can look very different by day and night. For day shots, Darren almost always doesn’t use a tripod, as he likes to work fast. For dusk shots, he emphasised that “in Singapore, the blue light of dusk exists for only about 10 minutes as we’re so close to the equator”. This kind of light happens 10 to 15 minutes after sunset time, which changes throughout the year (usually between 7 to 7.30pm). Before, it will be too bright. Immediately after, it will be too dark. There are convenient mobile apps available like Sun Seeker (for iOS, for Android) to check the daily sunset time. Darren will cross-reference a few apps to verify the information. Because the available time for dusk shots is so short, one can likely only shoot one to two angles each time in the 10 to 15 minutes. Thus, when shooting for clients, he will request two to three days minimum to ensure he can get all the required shots. In response to a question on his use of colour, Darren shared that he does not rely so much on a particular palette but “just tries to photograph things when the light is best” and that he doesn’t tweak his colours in post-production. Mornings in Singapore “sometimes still have a bit of atmospheric haze, so it may not be entirely crisp”. “Late afternoons and early evenings on a good day in Singapore have the best light”. Darren sometimes uses a drone these days, and shared that “even a mid range drone is quite good these days”. One just needs to be careful in Singapore by checking where they can fly a drone without a permit, and where it is not allowed. A drone also cannot go higher than 200 feet. OneMap.sg provides this information. For Pearl Bank Apartments, Darren flew the drone in a big field across the road. Darren has also previously done aerial photography from a helicopter. In such scenarios, it is mandatory to have an accompanying minder from MINDEF who will advise on what is forbidden to shoot for security reasons. Darren envisions that he will long continue to document Singapore’s architectural heritage against the backdrop of rapid urban redevelopment. Iconic landmarks that are in the news, and places of personal significance aside, he always keeps an eye out for buildings and sites around him that are visually interesting. Even as he walks or drives around, if a building catches his eye, he will try to find out its name, history, about its architect and to gain access (if required) to shoot it. He also encourages using online resources like Google Street View, which allows him to research access points before doing a physical recce, and even LTA’s live traffic cameras, which can be used to check the light in a given location: “If the cars form shadows on the road, you get a sense of whether there is cloud cover in that area”. Darren is realistic about the fact that given Singapore’s land scarcity, some redevelopment is inevitable: “Singapore is one place where architects consistently outlive their buildings”, he semi-joked. He noted that the majority of conserved buildings in Singapore are pre-war, and encourages the authorities to gazette significant buildings from our early independence years. He also believes the government can play a part in the maintenance of such buildings, such that owners will feel less compelled to sell, as some did with Pearl Bank Apartments which is structurally showing its age. Despite these challenges, and though the exhibition and publication title Before It All Goes may sound melancholy, Darren maintains that it is with “optimism” that he ultimately pursues architecture photography. He hopes that his work can spark a conversation that will engage Singaporeans from all walks of life. Watch the documentary produced in conjunction with Darren Soh’s solo exhibition Before It All Goes. Before It All Goes: Architecture from Singapore’s Early Independence Years runs at Objectifs till 29 Sept. Admission is free. The accompanying publication of the same title and the 50 HDB Facades tote bag by Darren Soh are available at Objectifs and via our webstore. View the Before It All Goes documentary (embedded above) at tinyurl.com/beforeitallgoes and share your photos and reflections with the hashtags #BeforeItAllGoes and #objectifscentre.